Word Is Bond premieres on Showtime on Friday, February 16th. We love hearing stories of how great musicians came to be the stars that they are today. The latest trailer for Showtime's upcoming hip-hop documentary Word is Bond did just that as the video gave a look into the very soulful Anderson .Paak's musical beginnings. The 2-minute clip sees .Paak talk about his early influences, and how he grew up making music in the church. At one point, the "Come Down" singer shares a story about how he thought that he'd end up being an MC, more specifically a gangster rapper. “I consider myself someone that’s coming up out of the hip-hop culture. And when I really was trying to write music, I thought I was going to be an MC. 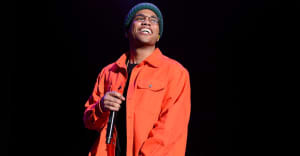 I thought I was going to be a gangster rapper,” .Paak said. “I was influenced by Snoop and Dre, and there was nothing bigger than that.” He went on to explain that he was also influenced non-hip-hop acts like Radiohead as well, saying that he liked "Sad white boy music too."